Do we have a good one for you today – the OnePlus 6 takes on the Huawei P20 Pro. Both devices are beautiful and look the part of a flagship. The P20 Pro has a fingerprint sensor on the front of the device, but the bezel size is still small enough to be acceptable. You will find a ‘notch’ taken out of the display on both of these models. The OP6 has a dual camera setup, but the P20 Pro takes it to a new level with a triple camera setup. Both devices have a similar look, size, and build to them. 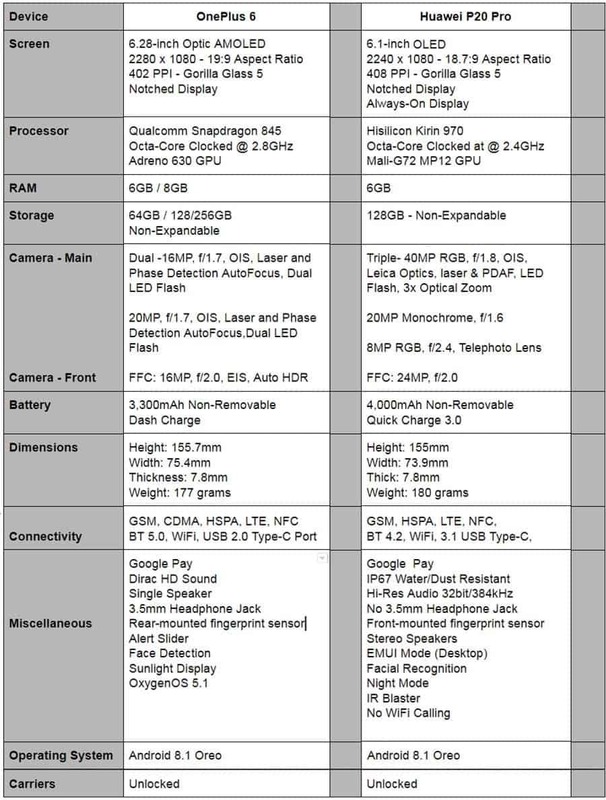 Please look over the specifications listed below before we look at what these devices have in common. After that, we will take a closer look at each smartphone to see if it is time to upgrade or buy a new device. The OnePlus 6 and the Huawei P20 Pro do have a few things in common. We can start with the physical dimensions and weight being almost identical – having close to the same size display makes this possible. They both use the same FHD+ resolution, a 19:9 aspect ratio, a notched display, and are protected with Gorilla Glass 5. Both use 6GB of RAM on the base model, both have a 128GB storage model, and neither one offers expandable storage. Both have multiple cameras (OP6 has two and the P20 Pro has three), while they both have large front-facing cameras (FFC). The batteries are non-replaceable, offer fast charging capabilities, but neither offer wireless charging. They have the usual suspects – Wi-Fi, Bluetooth (v5.0 on the OP6 and v4.2 on the P20 Pro), Hi-Res audio, fingerprint sensor, facial recognition, Google Play, and Android Oreo. 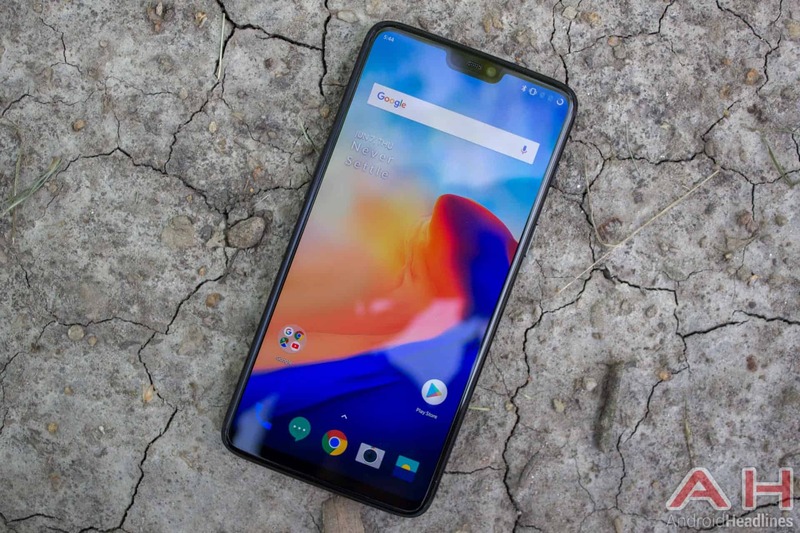 The days of buying a new OnePlus 6 device for $350 are long gone, but what you still get with a OnePlus device is great value for your money. A OnePlus device is well-built, has the latest processor/GPU, 6GB of RAM, dual cameras, and the looks of a true flagship. OnePlus improves on its camera and software with each rendition. Just as in the Huawei P20 Pro, the display will only be a FHD+ level resolution, but it does use the AMOLED display technology. It too, uses Gorilla Glass 5 on both the front and back, although neither device includes wireless charging. The OnePlus 6 sports a 6.28-inch Optic AMOLED display, along with its own version of a notch. OnePlus did decide to use the latest 19:9 aspect ratio giving it that taller, more slender look, along with a better entertainment and multitasking experience. The FHD+ resolution gives us 2280 x 1080 pixels with a 402 pixels-per-inch (PPI). The Sunlight Display provides better outdoor viewing. OnePlus does offer a software means to ‘hide’ the notch, but this is only a visual tweak – the notch is always there. 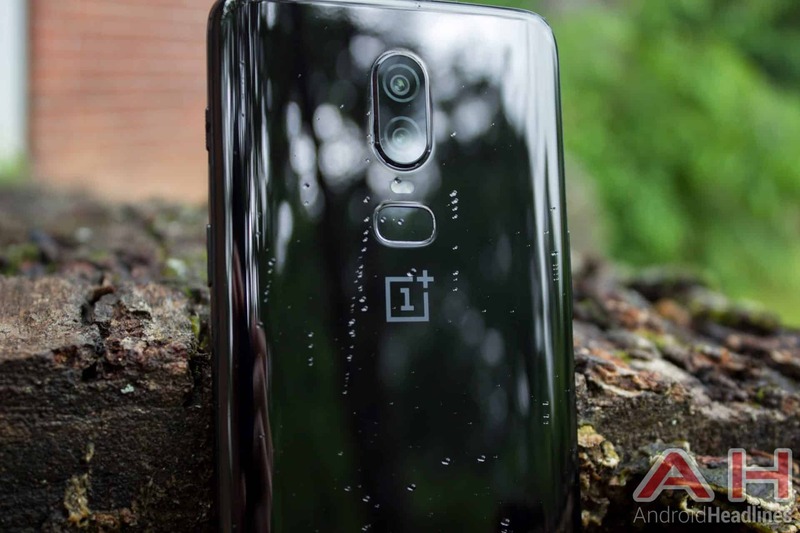 As with other 2018 flagships, the OnePlus 6 uses the latest Qualcomm Snapdragon 845 processor and Adreno 630 GPU to handle any graphic thrown its way. The Snapdragon 845 is an octa-core processor clocked at 2.48 GHz and is paired with 6GB of RAM and 64GB of non-expandable internal storage. For $50 more, OnePlus will give you 8GB of RAM with 128GB, and for another $50 on top you can a 256GB of non-expandable internal storage. A non-removable 3,300 mAh battery powers the OnePlus 6 and is compatible with the company’s Dash Charge solution. The OnePlus 6’s dual camera setup takes some great photos. OP also updated its photo software and menus to increase the quality of the photos taken, and also to make it easier to navigate around. The main camera uses a 16-megapixel sensor, a large aperture of f/1.7, and uses both EIS and OIS for stability. The secondary camera sports a 20-megapixel sensor with the same f/1.7 aperture. Both cameras use PDAF with a dual LED flash. The FFC employs a huge 16-megapixel sensor with an aperture of f/2.0 and has its own EIS and Auto HDR for wonderful selfies and video chatting. The Alert Slider can now act as a means to zoom in/out on subject matter when using the camera. The OnePlus 6’s pricing still offers great value compared to other smartphones, and the Huawei P20 Pro is a perfect example. Even with an FHD+ display and lack of expandable memory you would be hard-pressed to find more smartphone for the buck. OnePlus offers you 6GB or 8GB of RAM, it has an excellent dual camera setup and a large 16-megapixel FFC. The inclusion of NFC allows one to use Google Pay for mobile purchases as well as the transfer of files. There is no wireless charging or memory expansion, but then neither does the P20 Pro. The OnePlus 6 uses its own light user interface, OxygenOS, on top of Android 8.1 (Oreo), making it easier/faster to receive Android updates. The device measures 155.7 x 75.4 x 7.8 mm and weighs in at 177 grams. It comes in Midnight Black, Mirror Black, or Silk White. It will cost you $529 for the 6GB/64GB version, $579 for the 8GB/128GB version, and $629 for the 8GB/256GB version. There is no doubt that the P20 Pro is a real beauty from every angle, but we have come to expect that from Huawei smartphones. It has one of the best camera setups, not because it uses three cameras, but because it takes great pictures. It uses a very light user interface that Huawei calls EMUI 8.1, making it fast and smooth. The P20 Pro uses the latest HiSilicon Kirin processor, equivalent to the SD845, provides the user with a base of 6GB of RAM and 128GB of non-expandable storage. Unfortunately, there is no 3.5 mm headphone jack, but an NFC chip allows it to make mobile payments. While the P20 Pro comes with an unprecedented three camera sensors and Gorilla Glass 5, it still uses a FHD+ display and does not offer wireless charging. The device excites you with an OLED display, along with a notch. Priced at €899 ($1,055), it is a little on the steep side, especially when you consider that the OnePlus 6 will cost you no more that $579 for an 8GB/128GB model. The Huawei P20 Pro sports a 6.1-inch OLED display with a FHD+ resolution of 2240 x 1080 pixels and a 408 PPI. On one hand it provides an Always-On display although it is a basic design lacking any real customization, and limiting the user to the current time and date. Huawei did include a tall enough display that the notch does not affect the viewing experience with the apps designed to take advantage of the 18:9 aspect ratio. Gorilla Glass 5 protects both the front and back of the device. The Huawei P20 Pro uses its own quad-core processor, the HiSilicon Kirin 970, clocked at 2.4 GHz along with a powerful Mali-G72 MP12 GPU for outstanding graphics. The P20 Pro teams this processor with 6GB of RAM and 128GB non-expandable internal storage and Huawei offers no means to increase that amount. Huawei includes a large 4,000 mAh battery to power the P20 Pro that includes Quick Charge 3.0 for quickly charging your battery, although it is non-removable and does not include wireless charging. The large battery should easily get you through a day of moderate usage. We find many dual cameras on today’s smartphones, but the Huawei P20 Pro gives us three rear-facing cameras with Leica Optics. The main camera sensor uses a 40-megapixel RGB sensor with a large aperture of f/1.8 along with both laser and PDAF, an LED flash, and 3X optical zoom. The second sensor is a Monochrome 20-megapixel with an f/1.6 aperture. The third camera uses an RGB sensor with an 8-megapixel size, an f/2.4 aperture, along with a telephoto lens. The FFC is a huge 24-megapixel sensor with an f/2.0 aperture, allowing great selfies and video chats. The Huawei P20 Pro comes with Wi-Fi, NFC (allows for mobile payments such as Goggle Pay), Bluetooth v4.2, and adds an infrared blaster. There is no headphone jack, through some good sounds can come through the headphone adapter or from its stereo speakers. The camera is one of the best on the market with the addition of a monochrome camera, zoom features, and Night Mode. There is no Wi-Fi calling available and the P20 Pro is rated at IP67 for dust and water-resistance. The device measures 155 x 73.9 x 7.8 mm and weighs in at 180 grams. It comes in Midnight Black, Twilight Purple, Black, and Pink Gold. Retail pricing ranges from $900 to $1,055, depending on where you purchase it. With the Huawei P20 Pro’s three cameras and larger FFC and beautiful build, I really leaned toward the P20 Pro as the winner of this comparison. But I have to go with the OnePlus 6 as the winner of this battle – the main reason being that both devices are so equally matched (except the camera area) that the price of the P20 Pro is just not warranted. They both use a 6ish-inch display that uses an FHD+ resolution, a notch, 19:9 aspect ratio, and Gorilla Glass 5 all around. They use equally powerful processors and GPUs, the same amount of RAM, and neither one offers expandable memory. Both use a larger, non-removable battery, with fast charging, but no wireless charging. They both offer Google Play, Google Pay, and facial recognition. The OP6 includes a 3.5 mm headphone jack, rear-mounted fingerprint sensor and Sunlight Display. The P20 Pro does offer a crude always-on display, a slightly larger battery, stereo speakers, and an IP67 water and dust rating. However, those few extras will cost you almost $400 more than purchasing the OnePlus 6 at $579 for a 8GB/128GB model. 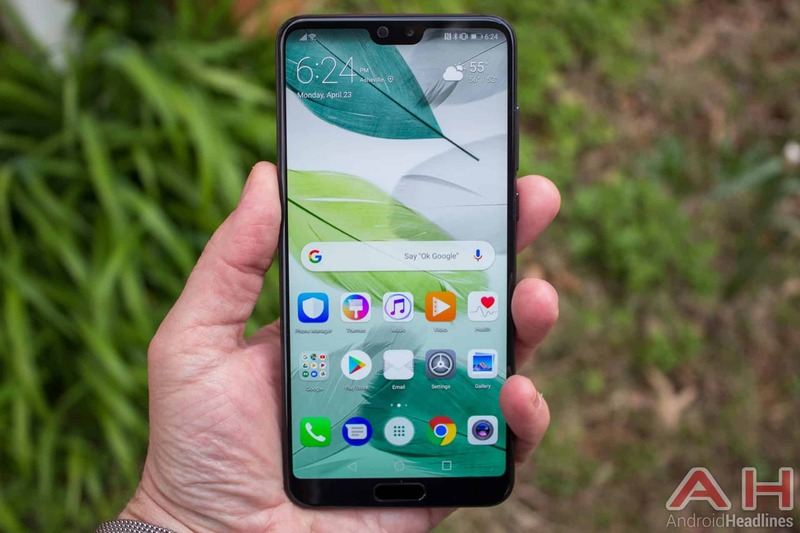 The post Phone Comparisons: OnePlus 6 vs Huawei P20 Pro appeared first on AndroidHeadlines.com |.